This is a half month edition of the Bulletin so that we can carry on with the Healey SR and XR37 story. I think we gave good coverage to the SR in the last Bulletin thanks to David Matthews. If you clicked on the SR/XR link to David’s wwah.org website you will already be ahead of me as regards the Healey XR37. 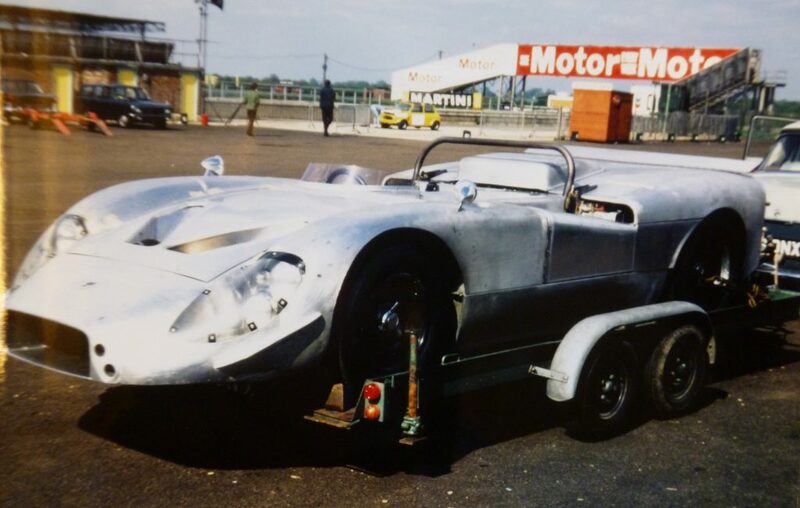 However, here is a brief recap – The Healeys, Donald, Geoff, Bic and their loyal team, had undertaken two unsuccessful but nevertheless encouraging attempts at Le Mans, in 1968 and 1969 with the SR fitted with a Coventry Climax V8 2.0Ltr. engine. Undeterred, they decide to enter a much modified car in the 1970 24 Heurs du Mans. This was to be a ‘Spider’ i.e. open top version fitted with a Repco Brabham 3.0 Ltr. V8 engine, conforming to the ‘Prototype’ Le Mans category at that time. This was the same category as the Porsche 908, Matra – Simca MS 650, Alfa Romeo T33/3 and Chevron B16; no competition then? The basic platform for the XR37 was similar to that of the 1969 SR but the wheel base was increased from 89 to 94 inches and of course the 2.0 Ltr. V8 Coventry Climax engine was replace by the Repco Brabham unit. After the engine the most dramatic change was to the body which was changed from an enclosed cockpit to an open version. Andrew Hedges and Roger Enever were the designated drivers. John Harris had done most of the testing on the XR37 as he had done on the SR. Again, as had happened with the two previous efforts with the SR, the XR37 suffered misfortune: at one time it had achieved a creditable position of 10th overall and with fourteen minutes of the twenty four hours left, the car failed, allegedly with an electrical fault. It was lying fourteenth at the time. That was the last time that Healey entered a ‘works’ team in a recognised motor sport competition. But what an illustrious heritage, one that is still talked about and revered amongst motor sport enthusiasts and journalists around the world. The 1970 Le Mans race was quite a significant one for a number of reasons, despite the fact that Denis Jenkinson (‘Jenks’) described it as a boring race in his Motorsport report of that year. It was significant because it was the year that the organisers, ACO (Automobile Club de l’Ouest), abandoned the famed drivers sprint across the track to their waiting cars. The reason why they took that decision is because of the injuries and fatalities that had been caused by drivers not fastening their full racing seat belt harnesses before accelerating away from the pits, anxious not to lose a place to the opposition. Not a wise decision set against the fact that the race is twenty four hours long and many other things are likely to happen in that time, some good some bad. In 1969 Jacky Ickx felt so strongly about this matter that while all the other drivers were running across the track to their cars Jacky just strolled across, got into his Ford GT 40 fastened his seat belt and set off after the others. Two things vindicated his decision, one, he won the race and two, tragically, the British privateer, John Wolfe, lost his life partly due to the fact that he had not fastened his seat harness. Hence the AOC’s decision to abandon the driver’s sprint for the 1970 race. The 1970 Le Mans race was also significant because Porsche won the first of its nineteen (a record) Le Mans races with a 917K driven by Hans Herrman (Germany) and Richard Attwood (born in Wolverhampton, England). Porsches were also 2nd (917L) and third (908L) and they won all the other classifications that year including the much sought after Index of Performance with the 3rd place Porsche 908L. Only seven cars were identified as ‘finishers’ that year – five Porsches and two Ferrari 512s (4th and 5th) the lowest total ever! Healey XR37 at DHMC Factory, Coten End, Warwick with Geoff Healey at the wheel, Bic Healey by the door, others in the photo are – Clive Hendrie, Bill Buckingham, Mike Guest, Jim Cashmore & Terry Westwood . Photo supplied by David Matthews. CR4804/2/195** Unpainted SR at Silvertone for testing. People L to R John Harris, (Healey team driver), Paul Hunt, Jim Cashmore, Barrie Bilbie (Chassis designer), Brian (Bic) Healey, Geoff Healey and DMH. Photo copyright owned by Leamington Spa based The Courier Newspaper. The Healey XR37 has quite a following amongst the Slot Car fraternity. In fact if you seach the internet for Healey XR37 you will find more entries for slot car versions that for the real car! Although this does involve a car related to an Austin Healey sister company. The main purpose of the Bulletin is to ‘showcase’ items, mainly photographs, taken from the Healey Motor Company Archive held at the Warwickshire County Record Office, Warwick, U.K. The reason for doing this is to keep the Archive’s existence in the mind of Healey, Austin Healey and Jensen-Healey enthusiasts. Hopefully, this will inspire some to come to Warwick to inspect items from the Archive for themselves, or, to order copies of items which have a particular appeal. The key to understanding what the Archive holds is the ‘online’ catalogue. This needs to be studied very carefully in order to get a better idea as to what material is available. Visit the Warwickshire Heritage and Culture website to learn how to use the catalogue and to order items, there is a link at the bottom of this page. The other purpose of the Bulletin is for the editor, who is a ‘free agent’ not employed by the WCRO, to introduce Healey related topics for the entertainment and education of Subscribers and visitors. It is not the purpose or intention of the Bulletin to research the Healey Archive itself in order to expand upon any of the items featured. However, the editor may present non Archive material which relates to an Archive photo or document featured in a Bulletin. If a reader wants to gain further knowledge on any Archive item featured in the Bulletin then they can submit an enquiry via the Bulletin email address or the WCRO website, both addresses are given at the bottom of the page. There may be a charge made for any research undertaken on behalf of an enquirer. The content in these WHMCA Bulletins is subject to statutory copyright law. Nothing must be used or copied from them without the written permission of the author and publisher (one and the same). To protect the originals’ copyright and authenticity, documents and photographs etc., sourced from the WCRO and shown in the WHMCA bulletins, will not be replicated in their entirety. It is intended that there will be sufficient detail to make them interesting to visitors to this website. Copies of the originals may be purchased from the WCRO, subject to that organisation’s terms and conditions. Images may also be enhanced for reproduction on this website, therefore their appearance, on a computer screen or a mobile device, may differ to that of the original. Save for the authorisation of the publication of Warwick Healey Motor Company Archive material described above, this website is entirely independent of the Warwickshire Country Record Office. Views expressed in the WHMCA bulletins are not necessarily views that the WCRO agrees with. The WCRO or the Warwickshire County Council will not be held liable for any views or material appearing in the said Bulletins unless it is clear that they are attributable. We (this website and the WCRO) operate a ‘take down’ policy in respect to any complaint we receive about a copyright issue in connection with any images featuring in WHMCA Bulletins. This means that images which are the subject of such complaints will be removed immediately until the complaint is resolved.